Bungalows Jaqueline in Sayulita are located in the center of town, only a quick two-minute walk to the main Sayulita beach. The bungaows are surrounded by gardens and typical vegetation of Sayulita. These spacious, comfortable rooms at Bungalows Jaqueline capture the typical contemporary essence of the Mexican beach town. The interior decoration offers a merge of native and modern elements that achieve an authentic Mexican decor offering you maximum comfort. Each bungalow is equiped with a kitchenette for quick cooking and an outside patio or balcony area. Bungalows Jaqueline offers occupancy up to 6 people with the choice of either single or double beds in the rooms. At Bungalows Jaqueline in Sayulita you can cool off in our newly built and beautifully designed pool with rock waterfall. The patio and gardens surrounding the pool area make the perfect spot to relax and enjoy the warm, sunny weather. Our place is perfectly designed for your comfort and tranquility while visiting Sayulita, but most importantly your security, so when you stay with us we'll make you feel at home! 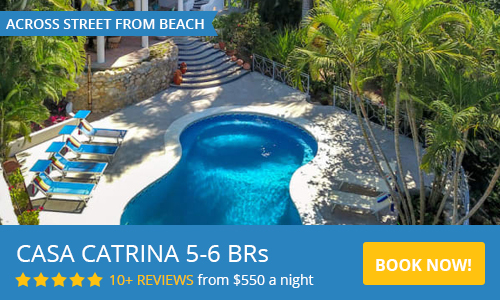 Located in the center of Sayulita, it is easy to find great activities to enjoy while on vacation such as yoga, scuba classes for kids and adults, Spanish classes and trips to the biological reserve of Marietas Islands for snorkeling and whale watching, zip-lining and horseback riding, and of course surfing.... or just relax! I booked a family reunion here and it was the perfect place. Everyone fell in love with it. Pretty Mexican decor beautifully maintained by friendly and very accommodating staff. (Please remember to give gratuity each day for the wonderful service provided by the housekeepers.) Darling courtyard of tropical plantings. Awesome large balcony with table and chairs overlooking side street of activity. Basic hotel amenities in delightful setting, perfectly located near the plaza, dozens of restaurants and a variety of small business shopping. Water pressure in bathroom low; shower faucet fine. Happily looking forward to next year’s return! Rooms are lovely and clean. Surroundings lush. Staff friendly and helpful. The bungalows are situate in the centre of town with all shops and restaurants within a very short walking distance. The beach a two block walk. My only advice would be that being in the centre of town it can be noisey at night with music from the bars. This was not an issue for me. I will definately stay here again. Perfect location - close to beach and shops/restaurants. Lovely pool area and friendly staff. Little on the pricy side for low season but location is so good. Would return.